Within the Analyze dialog, use the mouse or the Tab key to navigate between the available buttons and fields. Enter a name for the analysis in the Name field. The name supplied will be offered as a default name when saving the analysis as an .anl (E-Prime analysis) file. This field is optional, and does not affect the analysis if left blank. Analysis names may be up to 30 characters long, including spaces. The Variables list displays all variable names in the spreadsheet. Click and drag variables from the Variables list to enter them in the appropriate field (Column, Row or Data, respectively) in order to achieve the desired analysis. A variable may not have both a row and a column orientation, nor can it appear in the Rows list or Columns list twice. However, a variable may be moved between the Row and Columns lists by dragging a variable from one list and dropping it on the other. To remove a variable from a field, drag the variable from the current field (Column, Row or Data) back to the Variables list. 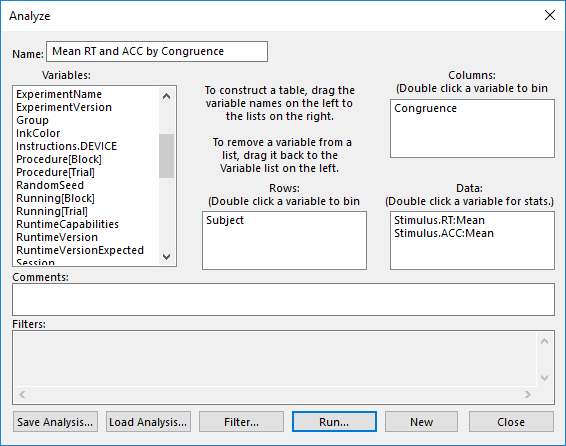 The Columns list displays the conditional variables to be used in determining the columns of the analysis. Variables may be reordered within the Columns list by dragging variables from one position and dropping them to their new positions within the list. Use of the Columns list is optional. A separate column will be created for each combination of the levels of every variable in the list. For example, if Variable A (with two levels) and Variable B (with two levels) are added to the Columns list, the analysis will create a column for each combination of the levels of Variable A and Variable B (i.e., A1B1, A1B2, A2B1, A2B2). A variable entered in the Columns list may be binned if the variable contains integer data (see E-DATAAID: Binning Data ). The Rows list displays the variables used as the “BY” factor in the experiment. Variables may be reordered within the Rows list by dragging variables from one position and dropping them to their new positions within the list. Use of the Rows list is optional. A separate row will be created for every combination of the levels of the variables in the Rows list. For example, if Variable A (with one level) and Variable B (with three levels) are added to the Rows list, the analysis will create three rows to accommodate each combination of the levels of Variables A and B (i.e., A1B1, A1B2, A1B3). Variables entered in the Rows list may be binned if the variable contains integer data (see E-DATAAID: Binning Data ). The Data list displays the dependent measure in the analysis. At least one variable must be entered in the Data list for each analysis. The data for any variables entered in the Data field may be summarized using various statistical measures. Double click any variable in the Data field to designate a method by which that variable’s data may be summarized. By default the data is summarized by the condition mean. 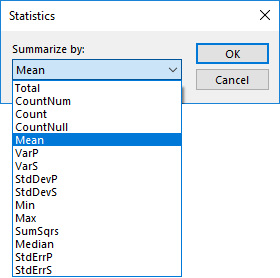 To collect more than one statistic for the same variable, add the variable to the list one time for each statistic desired, and choose a different summary method for each instance of the variable from the Statistics dialog. Count Number of times a value occurs for the variable whether numeric or string (provided the string is not the string for missing data). CountNull Number of times the value for the variable is equal to the string for missing data (NULL). CountNum Number of times a numeric value occurs for the variable. Variables may be removed from the Data list by dragging them from the list and dropping them on to the Variables list. Variables cannot be moved from the Data list to the Rows or Columns lists, or vice versa. However, variables may appear in either the Rows or the Columns list in addition to the Data list. The Comments field allows the user to enter up to two lines of additional comments concerning the analysis. Comments are included when an analysis is saved to an .anl file (E-Prime analysis file). The Filters field displays any active filters applied to the spreadsheet. If no filters have been applied to the data, the Filters field remains blank. The Filters field is read-only. In order to apply or remove filters, it is necessary to use the Filter button, or return to the spreadsheet and use the Filter command.